Lattis LE-808A and LE-1616A are stereo audio switchers that accept line-level analog audio sources. The units provide each output zone with independent control of source-selection (routing) and volume levels -- essentially a multi-zone preamplifier. The Lattis LE-808AHD is a Stereo Audio plus Component Video switcher with standard (75-ohm phono-jack) Component Video output. Our CT-808AHD Audio/Component switchers have CAT-5 (8-position modular) Component Video outputs. A/Vaux CAT-5 switchers connect using standard CAT-5 patch cables and in-wall wiring. These high-fidelity matrix switchers have adjustable volume, bass, midrange, treble, EQ-parametrics, balance, min, max, mute, and turn-on levels for each zone. Volume may be controlled using commands for absolute, relative, or ramp-up/down-start/stop. Group commands allow source-selection and volume control of multiple zones together, in addition to independent zone control. Each zone also has adjustable initial turn-on volume levels and volume taper rates for smooth switching. Source-Leveling trims the input sources to the same level. Any of our switchers may be daisy-chained together for up to 16 sources by 255 zones of audio/video distribution. With our LE-1616A-RE stereo audio switchers, there is no need for a distribution amp to split sources -- a ribbon-cable option connects audio sources to multiple units, for minimal cabling. Distributing zoned audio throughout the home or building requires a stereo (2-channel) power amplifier for each zone. Since the Lattis Matrix Switcher provides Volume/Bass/Midrange/Treble control internally, the zone amplifiers are generally fixed-gain (no volume control) power amps. Zone amplifiers are typically located near the Lattis system in the media center. Our audio switchers allow flexibility and choice as to the type and quality of amp to suit each zone. Instead of using a separate stereo amp for each zone, a multi-channel amp may be used -- 2 channels (left and right) are needed for each zone (for example, an 8-channel amp will service 4 stereo zones). 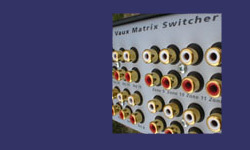 Lattis Stereo Audio switchers units may be combined with any of our other switchers for various signal routing needs. When combined with our component- or composite-video switchers, RS-232/Ethernet control provides commands for switching audio/video sources together, or breakaway control for audio-only or video-only switching. In addition to RS-232 or Ethernet ascii commands, all Lattis switchers may be controlled using infrared commands from an A/Vaux remote control or IR-learning remote or keypad. The Lattis LE-808AHD switcher combines a 6x8 Hi-Definition Component Video section with an 8x8 Stereo Audio section. The A/V sections may be controlled together or independently. Component Video outputs switch Hi-Definition signals to eight HDTV monitors up to 250 feet away, using triple-coax cabling. These switchers handle Hi-Def 1080i and 720p formats, as well as Progressive-Scan 480p signals, and Std-Def 480i. Note that the resolution of component video is dependent on the source signal, and that the HDTV monitor adapts to the resolution of the source. Lattis model CT-808AHD switchers combine a 6x8 CAT-5 Component Video section with an 8x8 Stereo Audio section. The A/V sections may be controlled together or independently. The CAT-5 Component Video outputs switch Hi-Definition signals to eight HDTV monitors up to 500 feet away, using CAT-5 cabling -- this provides the component signal and room receiver power on a single CAT-5 cable to the distant monitor. Use model CT-HDRX receiver modules with these switchers.